Eight Delegates: A, B, C, D, E, F, G and H are seated around a round table facing the centre. 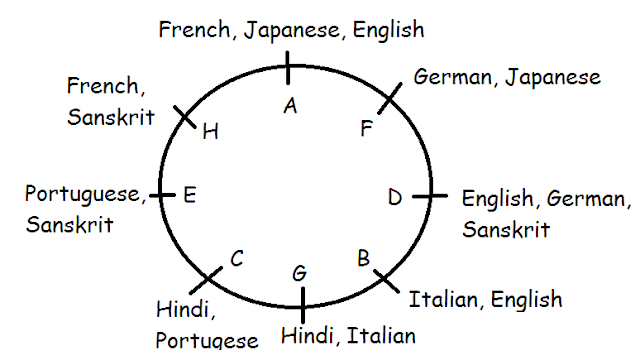 All of them can speak some languages: French, Japanese, English, German, Italian, Sanskrit, Hindi and Portuguese. A delegate knows at least 2 languages and a maximum of three languages. Any language can be spoken by a maximum of 3 delegates. The neighbouring delegates have only one common language in order to communicate with each other. Only neighbours communicate with each other. Not more than 3 people in a sequence can speak the same language. A speaks 3 languages French, Japanese and English. A and H are the only 2 persons speaking French. A is seated opposite to the one who does not speak English. G converses with C in Hindi and with B in Italian. B and D converse in English and D is to the right of B.
E speaks only Portuguese and Sanskrit and is seated opposite to the one who speaks German, English and Sanskrit. A is seated between F and H.
F speaks 2 languages, German being one of them. Apart from F only one other person can speak German. Not more than 2 delegates can speak Japanese, Italian, Portuguese and Hindi. C does not speak Sanskrit. Only 2 delegates knows three languages. 1. What is the position of F with respect to the one who speaks Sanskrit, English and German? 2. Who is the person other than E who speaks Portuguese? 3. Which of the following language is spoken by F? 4. Which of the following delegates speaks Sanskrit? 5. Which of the following is correct combination of delegate: Languages? Eleven friends Abhishek, Ankita, Bharti, Deepika, Karthik, Nikita, Pranav, Rajkumar, Ratnesh, Satish and Vinay work in the company xyz private limited. They decided to play the Secret Santa game. Everyone had to pick a single chit which had the name of one of her/his friends. If Abhishek picks up the chit with name of Ankita, Abhishek will be the Secret Santa of Ankita. One who picks up the chit will be the Secret Santa for the person whose chit she/he picked and then will have to gift something to her/his friend. If one picks her/his own name, she/he will have to pick again till everyone gets the chit of the person other than themselves. Eleven chits were prepared but due to some chemical reactions, the names could not be read properly. Following is the only information that could be derived from the chits. Abhishek could only read the letters 'R' and ‘H’in his chit. Ankita could read only ‘K’ and 'H. Bharti's chit had only 3 vowels (not necessarily distinct). Deepika picked up the chit which did not have the letters H, R or S.
Karthik's chit had a name that had only 2 distinct common alphabets as his own name, while the each distinct common alphabet may/may not have repetitions in either name. Nikita could only read A, H and B.
Pranav could read only S and H in his chit. Vinay picked that person's name who picked up Nikita's name. Ratnesh picked that person's name who picked up Karthik's name. Ratnesh did not pick Nikita's name. Rajkumar did not pick Satish's or Bharti's name. Ankita's name was picked up by that person whose name was picked up by Abhishek. 6. Who was the Karthik’s Secret Santa? 7. Whose name did Rajkumar pick? 8. If the persons picking up the chits, picked them in the alphabetical order of their names, then at what number was Ratnesh’s name picked up? 9. Which of the following is the correct combination of Name: Secret Santa? 10. If the persons picking up the chits, picked them in the alphabetical order of their names, then whose name would be picked up last?